Freeline Studio is a furniture design and build company, led by Robert Nestman and Saskia Erdmann. Our passion is to create unique, modern furnishings and functional spaces, such as in-home offices and libraries. We produce a line of furnishings for selected retailers, but our focus is mainly on custom work for our clients. As principal designer, Saskia uses her keen eye to devise functional modern furniture with an added touch of courageous lines. Combined with the years of experience and craftsmanship of Robert, Freeline Studio creates pieces that are reflective of our clients and their lifestyle. We focus on using FSC (Forest Stewardship Council) certified wood, including wood from the Harrop Proctor Community Forest here in the Kootenay’s. We also use solid wood laminates, metals, and glass to enhance the beauty and functionality of our designs. To make use of even the smallest pieces of wood we developed our own unique parquetry board. It is used to accent some of our designs and for items such as shelving, cutting and serving boards. We use non toxic glues and hand-finish all our products with environmentally friendly natural oil sealers and resins, which enhance the natural beauty of wood. These finishes impregnate the wood unlike traditional products that create a surface film. Most importantly, they are a healthy choice for you and the environment. 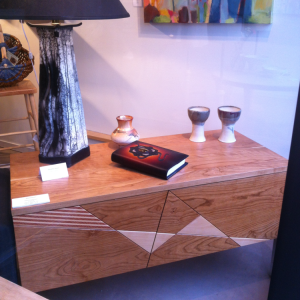 My husband and I are impressed by the beauty and innovative designs of the furniture created by Freeline Studio. Our home is graced by several Freeline pieces including a particularly stylish one we actually brought into our sitting room just today. But the largest work we commissioned was a beautiful bookcase staggered along an entire wall and much enhanced by one of Freeline's signature metal touches and by the fact that Robert Nestman took the care personally to select the wood. He is a joy to work with -- his estimates accurate, his craftsmanship precise and imaginative. This young firm has my unreserved recommendation. Saw one of Robert's benches at a design show in Vancouver -- loved it and almost bought it on the spot. Got in touch later by phone to learn that particular bench was sold shortly after I admired it! Now I have a custom bench which perfectly suits the blank space under a large painting, even echoing some of the natural colors in the pastoral work of art. At every stage of the making of the bench, Robert was flexible (I travel a lot but we were able to arrange home delivery on one of his trips to Vancouver). The storage behind the angled doors is just what I needed. The doors themselves have high-end hardware which enables smooth-yet-firm opening and closing. Robert built us a home office with a hanging bookshelf and an L-shaped desk with two work stations, drawers and cupboards. From planning to installation, we were very pleased with Robert's ideas and amazing workmanship. By listening to our needs and vision, and considering the office space and budget, Robert came up with a great plan, which he implemented in a timely manner. His work is both artistic and functional. I am thrilled with the work that I have had done by Freeline Studio. I had Freeline Studio refinish two vintage office chairs for my office. They came out wonderful and I am very happy with the results. They have also built me a kitchen stool with steps. The hardware is amazing. Everything glides so smoothly. You will not be disappointed with Freeline's work.